This theory is really lacking on substantial evidence, but since I got a moniker on Shadow Freddy identity I thought I could give a shot at guessing Shadow Bonnie. 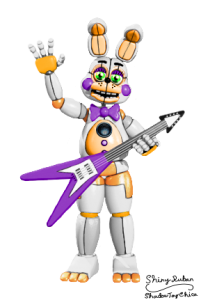 For starters let’s consider that its only real appearance in the series is limited to FNAF 2 and a cameo on activating the FNAF 3 minigame (FNAF 3 minigame itself doesn’t count because it should be black instead of purple, for it to be Shadow Bonnie, so I’m going to trust sprite consistency and say that this Bonnie is Springtrap’s soul). 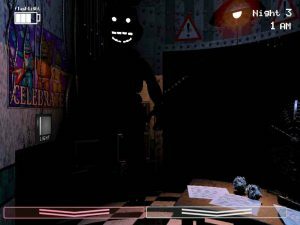 So from FNAF 2 we know that it appears and disappears from the office, so it is an ethereal presence, unlike Shadow Freddy, who I have said that it is a human on a theory before due mainly to the fact that the one having dreams in FNAF 2 seems to have a Shadow Freddy mask (See in the Mega Timeline Theory the section About Shadow Freddy). It is a black coloured soul, and it is not the only one we have seen. Puppet’s soul is also black as seen in the FNAF 3 minigames. So having a black soul may be important, it may be a clue on if the soul has paranormal abilities, like giving life. If we ever get to see at some point the Ice Cream Girl’s soul if it is black coloured it could confirm this part (black coloured souls having paranormal powers), because it was her the one who brought Michael back from the death after the Scooper and after vomiting Ennard (also doing so after he was bitten in FNAF 4). One popular theory says that Shadow Freddy and Shadow Bonnie are Springlock victims, but I believe that it is only halfway true. Shadow Freddy is too different from Shadow Bonnie, so I don’t think they are related to one another, and also what I mentioned before about him being a human in a suit. So the only Springlock victim is possibly Shadow Bonnie. Let’s move onto the Springlocks themselves. 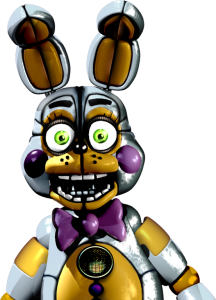 There are only two Springlocks (FNAF 3 phone call specifies this) Spring Bonnie and the suit seen on night 4 of FNAF sister location, Springtrap isn’t the real Spring Bonnie suit, but a replacement, a spare golden one. But that’s not the important thing in this theory. It is highly believed that the suit seen on night 4 could be Chica’s due to the similarity to Toy Chica’s design, so going by this reasoning, could the real Spring Bonnie’s design be closer to Toy Bonnie’s? Shadow Bonnie have a closer design to Toy Bonnie than Springtrap, reinforcing the idea that the Spring suits are closer in appearance to the Toy animatronics than the Withered/Classics (which Springtrap seems to be closer to the later). The proper base of the appearance of the Springsuits are the Funtime animatronics due to the faceplates, and yet, the Funtimes are close in design to the toys (rosy cheeks, hard exterior instead of fur…). So in short, Shadow Bonnie is a soul with supernatural powers (perhaps the ability to give life) that died in a Springlock accident. Now for the baseless opinions: I wonder if this power is inherited from parent to children (they’ll be puppet’s father/mother or Mrs Afton, Ice Cream Girl’s mother). I also wonder if it is a female; (because if the Night 4 suit is Chica, the performer has to be female) Spring Bonnie is unknown if male or female, so usually this kind of role in acting is fit by a female. It would also make a dark joke if both the performers were female because they’ll become Iron maidens just like the Springlock suits.